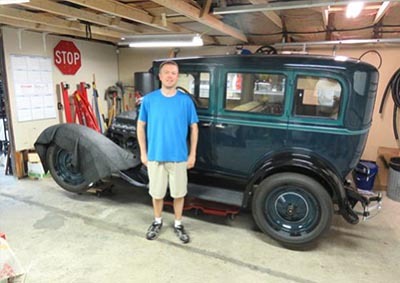 All it takes is membership in the National AACA and an interest in the old car hobby. For less than the cost of a good dinner, you can benefit from the unique and valuable experience of people who have been playing with old cars for decades. TRAACA is one of the most active and open clubs in AACA, with monthly meetings and special programs year-round. No matter if you are restoring a Vega GT, a Model A Ford, or a Rolls-Royce, you'll find someone in TRAACA who can help you with your project. Remember that you will also need to be a national member of the Antique Automobile Club of America - the largest and most active antique car club in the world! Click here to go to the AACA National web site. To join TRAACA, you can download a current membership form below. If you do not have access to a printer, a link is provided to receive a form through the mail. NOTE: If you are an EXISTING TRAACA Member, please review, update, sign, and submit your pre-filled membership renewal form along with payment. If you did NOT receive a Pre-Filled form via email or U.S. Mail, please contact our Membership Chairperson, Jerry Adams (Information below). You can also contact Jerry for more information about the club, or for answers to any other questions you might have.